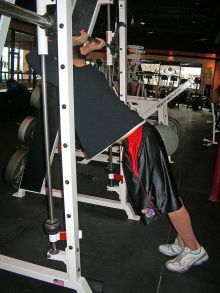 Standing distance facing bar approximately lower chest height. Grasp bar with both hands. Lean body forward so bar is behind/under bar and arms are to sides of head. Feet are keep away from bar. Allow upper body to hang downward while keeping arms to sides of head. Hold stretch. Triceps become more involved if shoulders are keep close to wrists.